Indoor and outdoor temperature, relative humidity as well as wind speed and radiation are recorded by a dense network of sensors linked to control panel. Recorded data are used to set and realize the desirable conditions of temperature, humidity, ventilation, shading etc for crop development. 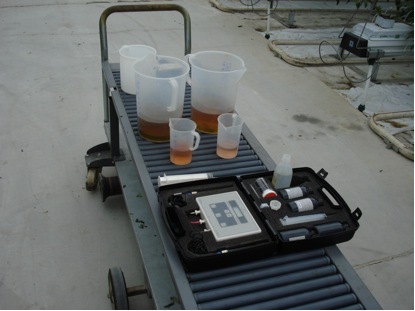 In parallel, CO2 concentration into the greenhouse is recorded and adjusted, following the crop demands by enriching of the greenhouse with the processed waste of natural gas burning. Fertilization and irrigation of the plants are carried out by a fully automatic network, adjusting solution flow and density to the fertilization recipe desired. Well water used, as well as drip and slab water are systematically control while all fertilization remains are recycled to the supply network.